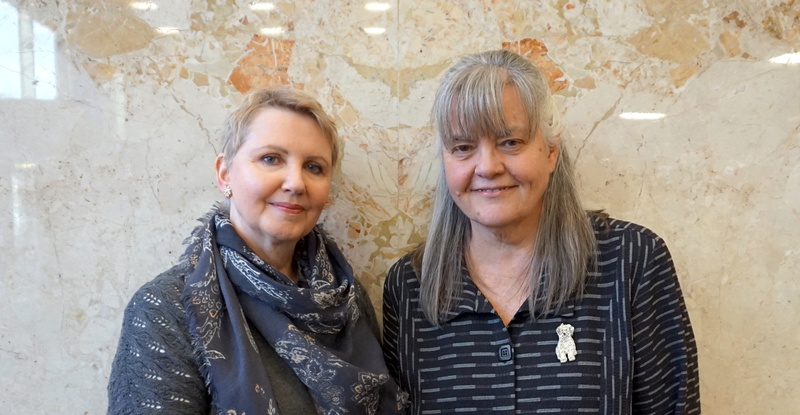 It is with pleasure that the Centre for Critical Qualitative Health Research at the Dalla Lana School of Public Health, University of Toronto announces the appointment of Dr. Brenda Gladstone (right) and Dr. Gail Teachman (left) respectively as CQ’s new Director and Associate Director. Dr. Gladstone is the former Associate Director of CQ (2016-2018) and an Assistant Professor at the Dalla Lana School of Public Health, where she teaches Foundations of Qualitative Inquiry (CHL 5131) and the compulsory CQ certificate course Qualitative Analysis and Interpretation (CHL 5115). At CQ, she has been the leader of our community of practice for methodological innovation, including projects on arts-based approaches to qualitative health research (QHR) and participatory approaches to engage children and youth in the research process. Dr. Gladstone’s expertise on qualitative methodologies applied to sociology of childhood and sociology of mental health and illness have been acknowledged internationally, most notably as a Visiting Scholar in Australia and Norway. Presently, she is working with Austrian and Norwegian colleagues in an innovative project adopting open innovation in science (OIS) principles to establish research priorities in children’s mental health and examine the methodological implications of this approach to citizen science, as well as promoting the advancement of QHR graduate education in countries such as Australia, Norway and Brazil. Dr. Teachman is an Assistant Professor at the School of Occupational Therapy, Western University and an Academic Fellow at CQ since 2017. She has previously taught the course JRP 1000 Theory and Method of Qualitative Health Research as a contribution to CQ’s curriculum. Dr. Teachman’s research advances interdisciplinary studies of childhood ethics in the context of disability and rehabilitation. She has developed innovative methodological approaches for doing qualitative research with disabled children and youth, including those with communication impairments. Locally, Dr. Teachman is leading the development of a partnership model for meaningfully engaging disabled youth in research; internationally, she is collaborating to adapt qualitative methodologies for culturally-safe and attuned research with disabled youth in Zambia. She is a co-investigator with the McGill University initiative VOICE (Views on Interdisciplinary Childhood Ethics), which brings together researchers, community partners, and stakeholders to promote research and practice development in this field. It is my belief that CQ will greatly benefit from the vision and expertise that their joint leadership will infuse into our Centre, as they lead by example. In terms of educational scholarship, Dr. Gladstone and Dr. Teachman have been highly praised for their mastery of the subject and dedication as graduate instructors. Their ability to address current onto-epistemological debates while concomitantly teaching methodological skills will continue to inspire students and fellow instructors. In terms of methodological scholarship, their focused, shared interest in methodological innovation in the health sciences will take CQ into a new realm of national and international contributions towards interdisciplinary, theory-driven QHR advancement that reveals the social dimensions of health and health care and situates the Centre at the leading edge of the field of qualitative methodology. Please join me congratulating Dr. Gladstone and Dr. Teachman on their appointments. Cite this page as: CQ. (2019, January 07). CQ Director and Associate Director Appointment. Retrieved from: https://ccqhr.utoronto.ca/2019/01/07/cq-director-and-associate-director-appointment/.